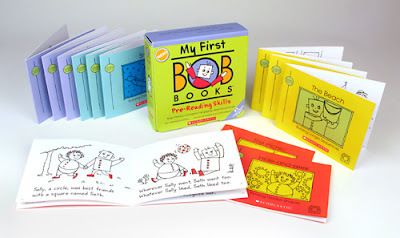 These were our favorite books for learning to read -- The Bob Books. Good news, they work great for all kids and especially with my dyslexic son. They are a perfect size to carry with you for those anytime teaching moments, or waiting at appointments. You can shove a few in your purse and have them with you. We used all of them, sets 1 through 5. Sometimes I find them at Costco for a good price. They are available on Amazon for a good price, everyday. Also check out their blog site for ideas.